When I was growing up, I used to love talking to my grandmother. She was always one of my heros. She lived in Florida, so we didn’t see her too often, but whenever we interacted, it always felt magical. She would call our house on Christmas Eve and leave a voicemail pretending to be Santa Claus—this tradition lasted way past the time that my brother and I knew that no such person existed. Once when she came up to visit, she brought my dad’s half-brother, my Uncle Zach. I was really young at the time, and he’s not much older than me. It was winter, and Zach had never seen snow before—he rolled around outside, amazed. My grandmother never had much, as far as money goes. She was poor, she lived with roommates right through old age. She was a flight attendant for a while, then worked odd jobs here and there, in coffee shops and restaurants. She may have been poor, but she had more friends as an old lady than the most popular kid in high school. As Zach entered adolescence, he became rebellious. He started using drugs, and like many poor kids, he saw the allure of easy money that came with crime. He fell into it. Still a teenager, he was arrested and was charged with multiple felonies. In many American states, criminal law is defined by a “three strikes” system. Implemented in 1994 under Bill Clinton during the escalation of the War on Drugs, three-strikes laws make it so that anyone convicted of three crimes, including at least one felony, will face very serious sentences, often life in prison. The specifics of how three strikes laws function vary from state to state, and Florida’s is one of the harshest. Because Zach was convicted of more than three crimes, he was sentenced to 20 years. The crimes he committed would have probably gotten him around a year in prison in Canada. I was just a kid at the time, less than 10 years old. But I remember the frantic calls between my dad and my grandmother, the confusion, the pain of having a family member ripped away and locked in a cage. My grandmother was heartbroken in a way I had never seen before, and that heartbreak would follow her for the rest of her life. That was the first time I had ever really been forced to think about prisons. How could they do that, how could they steal away the best years of my uncle’s life? What benefit comes from tearing apart families? I knew that Zach had messed up—he would be the first to say it—but the whole thing seemed wrong. I remember, in those early days, I used to think a lot about how the American justice system was particularly evil. This type of thing wouldn’t happen in Canada, I thought. Our society isn’t as cutthroat as our neighbours to the south; we’re friendly, we don’t have the same types of problems with crime and mass incarceration. Sure, we’ve got prisons, but up here the only people inside them are hardened criminals with nowhere else to go. Right? My grandmother had always been an activist—she had been active in the civil rights movement, and used to love to show off the scar on her forehead from taking a police baton at the Democratic Convention in Chicago 1968. After Zach got locked up, she started organizing with a network of people with incarcerated family members, called Little Old Ladies in Tennis Shoes. During her time there, LOLITS worked on getting mandatory minimum sentences reduced, sometimes successfully, by supporting groups like Families Against Mandatory Minimums. I guess that, in a lot of ways, my own drive to change the world came from her. I started being genuinely politicized during the student strike in 2012, when students fought successfully to prevent a massive tuition hike in Quebec. I remember getting off work and seeing kids being brutalized in the street for protesting. Mass arrests were common back then, and some students faced serious criminal charges. Later, I started organizing in the environmental movement, which often meant working alongside Indigenous folks who led that fight. In a way, my formative years as an activist forced me to learn about police and prisons—stories about friends of friends being criminalized are a crash course about what happens to people snatched by the jaws of the carceral state. This understanding, forged through my own confrontations with systems of power, shattered my closely-held myths about a kinder, gentler Canada. Indigenous people in Canada are 10 times more likely to be incarcerated than non-Indigenous people—that’s higher than the proportion of Black South Africans imprisoned at the height of apartheid. In America today, Black men are six times more likely to be locked up than white men. From a historical perspective, this shouldn’t be shocking. The institutions of law and order in this country were founded, in many cases explicitly, with the goal of targeting Indigenous people. The Royal Canadian Mounted Police was originally called North-West Mounted Police—itself inspired by the Royal Irish Constabulary, a paramilitary force which the British used to violently colonize Ireland. This force, the first of its kind in Canada, was regularly used to put down Indigenous rebellions and clear land on Canada’s western frontier for settlement. In the prairies, agents of the Canadian state confiscated crops and left them to rot in order to starve Indigenous communities, get them off their land and force them onto reserves. Today, the prison system in Canada is about more than just cops, walls, and razor wire. It is a network of interlocking institutions that profit from locking people in cages. From the companies that “insource” prison-workers to avoid minimum wage laws and worker protections, to companies making their money selling food and goods at absurd prices to people inside (including Concordia’s food provider, Aramark, which has repeatedly been accused of giving prisoners food poisoning), the prison industry in Canada is big business. That business sustains itself in a self-perpetuating cycle. It’s prison guards’ unions advocating harsher confinement practices. It’s the refusal of the courts to prosecute killer cops. It’s cultural stereotypes that uphold white supremacy and make us afraid of our neighbors. It’s the idea that we don’t have the capacity to solve conflict ourselves, that we need the courts as an arbiter. Together, these institutions are often called the prison-industrial complex. The prison system is also about more than crime. Nearly half of federal inmates have been diagnosed with Antisocial Personality Disorder, and around 15 per cent have been diagnosed with Borderline Personality Disorder. Over half of inmates don’t have high school diplomas, and around two thirds have a history of substance abuse. Since the 1960s, Canada’s incarceration rate—the amount of prisoners compared to the overall population— has nearly doubled. As social services, including mental health services, have faced systematic cutbacks, the prison system has grown in proportion—despite dramatic decreases in crime rates since the 1990s. The people absorbed into the machinery of the prison-industrial complex have been abandoned by neoliberal capitalism; they’re people viewed as disposable. Prisons aren’t about protecting citizens from crime, they’re about managing the people we leave behind. With all this in mind, how might we imagine a world without prisons? How can we make prisons, and the prison-industrial complex, no longer necessary? How do we get from here to there? I’m not going to pretend to have all the answers to these questions. If we’re going to move towards a society that’s truly based on justice, then we need to walk that path together—no single person can provide the way. The movement to abolish the prison-industrial complex—led by prisoners themselves and their family members— has been grappling with this question for a long time, since the prison abolition movement began to take hold after the violent repression of the Black Panthers in 1960s and 1970s America. As the leadership of the Black liberation struggle were locked away for decades, they began to organize prisoners, culminating in a series of prison rebellions, most famously the Attica Prison Uprising in New York, on Sept. 9, 1971. Forty-five years later, to the day, prisoners in the United States commemorated that anniversary by launching the largest coordinated prison strike in history, aimed at ending prison slavery. Canada also has its own history of prisoner resistance. In 1976, hundreds of prisoners at Archambault Institution near Montreal launched a strike that lasted 110 days, demanding better living conditions, and the formation of a committee of prisoners tasked with writing a constitution outlining prisoners’ rights. The strike won some of the prisoners’ more specific demands, including an end to the prohibition on conjugal visits. The success of the Archambault strikers led to a wave of prisoner resistance across Canada in that same year, including coordinated hunger strikes in every maximum-security prison demanding an end to solitary confinement. This wave began an unbroken line of prison rebellions that continues to this day. In 2017, inmates in Saskatchewan organized to stop working when their wages were cut to $1 per day. Prisoner resistance is a hidden, but permanent feature of the carceral state. 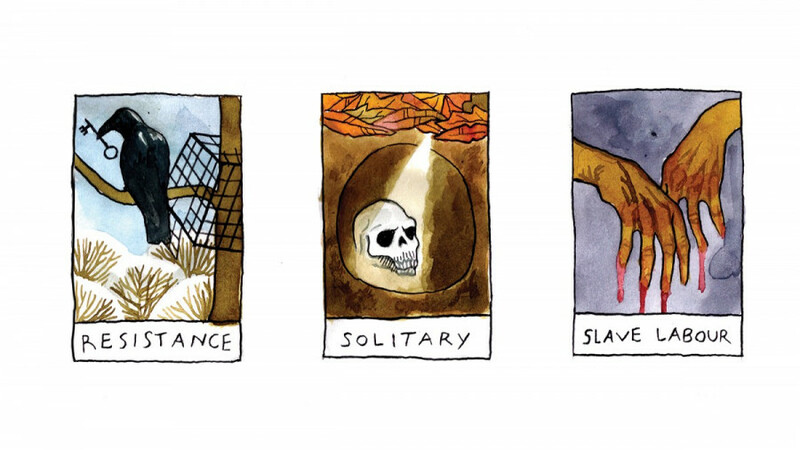 To go beyond fighting the worst effects of prisons—the slave labour, solitary confinement, inhumane conditions—and towards a world without prisons at all, prison rebels can’t be left to fight on their own. On the outside, we need to challenge the broader systems that make prisons seem necessary. We also need to find alternatives to incarceration in the very real cases where people harm one another. The seeds of such an alternative can be found in restorative and transformative justice processes. Restorative justice grows from that desire, and is beginning to be used on a small scale in some criminal cases. Acknowledging that crime is harmful to communities, this process seeks to restore relations without the further harm that comes from pulling people out of their networks. As such, it is an inclusive and participatory process, and is led by the people directly harmed. The perpetrator is asked to give back to the people they have harmed, and to their community more broadly, in order to restore trust. Transformative justice pushes this perspective further, asking what the root causes are. Have the perpetrators been harmed themselves? How might their social context have contributed to their decision to harm others? How, most importantly, might we transform the relationships that led to harm in order to prevent it in the future? As a process, transformative justice requires input from entire communities and allows for an understanding that goes beyond the hyper-individualized approach to crime that has miserably failed at keeping our communities safe and strong. It is a holistic approach, one which attempts to change the conditions which lead us to harm one another. Zach and so many others like him were never given the option to change their behaviour to heal themselves and their communities. Instead, prisoners like Zach are stripped of their humanity and fed into a machine that is designed to break people. I write him whenever I get the chance, and I’m proud to say that he’s unbreakable. But not everyone is so lucky. Many of the people who don’t have outside support end up permanently scarred, condemned to going back and forth, in and out of the prison system for their whole lives. The real Canadian recidivism rate—the rate at which people who are incarcerated eventually return to prison—is unknown, because government statistics only track people for two years after release. Some surveys point to a rate being as high as 70 to 80 per cent when tracked for longer. My grandmother passed away in 2013. She never saw Zach as a free man again. She dedicated those last years of her life to fighting against the prison system, alongside others like her who had family members taken away. In that way, the prison system took years of her life, as well as Zach’s. One day, we will live in a world where humans are no longer locked in cages— but building that world is up to us. In the meantime, we can support the people inside who struggle for better conditions, and change the society outside the walls in a way that makes prisons obsolete. Every step of the way, I’ll be thinking of my grandmother. Our generation can build the world she never got to see.